Uncategories Thief or Chief… Sir, its typographical error…!!! Thief or Chief… Sir, its typographical error…!!! Chief or Thief… Sir, it's typographical error…!!! An old Remington typewriter lying in one of the corner of my drawing room – a place where the guests are entertained – reminds me of the old days when there used to be a talk about the computer in the office discussions, but it took around 26 years to reach on my table during my service career. The typewriter placed in a quiet corner beside a wall, which my grandchildren are now trying their hands to know the old technique of typing but it has definitely become an antique piece for us. But I too do sometimes enjoy the typing on the typewriter to refresh my old memory and association with the typewriter. It looks bizarre to any visitor to our place in the advanced computer age when there is always a question from anyone interested in knowing the new invention – As to what would be next invention? No doubt computer is a noiseless apparatus with no rhythm in typing even on the keyboard, which is so soft, yet the sound of typing on the writer was sometimes so melodious, there had never been a single mistake in the full paragraph. The typist, however, has to be conscious to hear the margin bell to push the lever to go to the next line and moving of the paper with equal spacing. The typewriter was one of the greatest turning points in history. The typewriter benefited countless businessmen, researchers, and professionals who were all obliged to undergo the drudgery of the pen. Because of the speed of writing the typewriter became the driving force in nearly every company's growth. 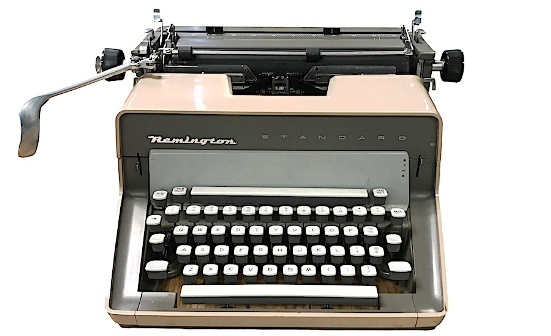 In those days, the typed letter received or sent to the other end had quick attention and response as it was easy to ready than the handwritten letter. 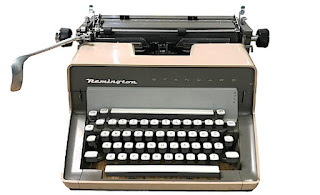 I know, the typist had to use a carbon to get more than one copies and sometimes to go in for typing the whole letter or draft for the second when more number of copies were required. Frankly speaking, I learned the typing with proper lessons of keys in three lines as asdfgf-space-;lkjhj of the first line and so on despite holding the professional qualification. As compared to the computer where you can do correction instantly but while typing, either it has to be crossed with XXXX and retype the text or sometimes the correction fluid was used. There could number of typographical error noticed by the readers which the newspapers used to regret the same. One such typographical error – also called misprint – a mistake made in the typing process of printed material – was – Due to a typing error, Saturdays’ story on local artist Jon Henninger mistakenly reported that Henninger’s bandmate Eri Lyday was on drugs. The story should have read that Lyday was on drums. The Sentinel regrets the error. Once I too committed an error by typing ‘not’ instead of ‘now’ while sending the notice for meeting as – the meeting will not be held on next Monday. Then I had a tough time with my boss when none came to attend the meeting. I recollect an incident which I cannot forget that when the typist at the Civil Secretariat has to face the music of his seniors relatively has to pay the high cost when a letter addressed to the Chief Engineers was typed as Thief Engineers inadvertently as both letters T & C are typed with the left-hand fore-finger. Perhaps it might have escaped the attention at all the levels as this glaring mistake was pointed out only from the receiving end. The typist when asked said, Sir, it’s a typographical mistake. If you know to type, do take care of glaring mistakes…!